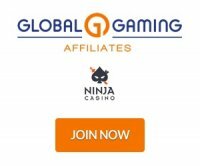 Always Vegas Affiliates is a casino affiliate program for Alwaysvegas.eu. This casino uses Rival gaming casino software and is licensed in the Netherlands Antilles. This casino is available in English, German, French and Spanish and accepts players in Europe and the United Kingdom but not from Canada or the United States. Always Vegas casino is owned by Bonne Chance NV. Affiliates get a starting revenue share commission rate of 25% and this can climb up to 35% for a monthly net loss above $30,000. No CPA payment plans are listed and sub affiliate commission rates are 3% for referring other webmasters. The affiliate program features the standard Rival backend. Affiliates can get access to detailed reports to find impressions, clicks, fun players, real money players, first time depositors (FTDs) and commissions earned for any given time period. The creatives and marketing materials include text links, embedded flash games, slot reviews, slots artwork, casino reviews, flash banners and gif banners. The Always Vegas affiliate program is probably better than the average Rival casino for player and affiliate support. The casino has more European languages which is their target market since they don't accept Canadian or American players. Payments are made every month and payable by Neteller, Skrill, EcoCard, bank wire, check/cheque and player account.